Feature Focus: DVR Examiner 2.5 Aspect Ratio - DME Forensics Inc.
Those who have been working in video for a while – especially those who have been around long enough to see the change from analog to digital video – know that aspect ratio is a Pandora’s box. We are moving toward a world where the square pixels that we see represent square samples captured by a digital camera, but we aren’t quite there yet. However, this is not going to be an article on the details of aspect ratio. There are already good articles out there (and a lot of bad ones) which explain why the move from analog video to digital left us with rectangular pixels, and why you might look shorter and fatter in the USA but taller and thinner in Europe. It is a very involved subject, one where experts still disagree on some of the more delicate points, and it can be important if you want to “correct” the video footage. However, DVR Examiner is designed to make it easy to find and retrieve the data you need. There are many other tools for correcting the aspect ratio. If DVR Examiner isn’t designed to correct the aspect ratio, why is there a new “aspect ratio” button in the preview tab of DVR Examiner 2.5? The problems with rectangular pixels mentioned above can lead to a difference of about 10% in height or width (usually depending on the country you live in). This problem may be undesirable and may even be something you want to fix later, but it usually won’t prevent you from understanding the video well enough to find the footage. However, sometimes systems “subsample” in the vertical direction – taking only every other row of data and leading to the image being only half as tall as it should be! This altercation can make it significantly harder for investigators to understand the video. It can make matters worse when clips switch between recording a full frame or only half a frame within the same clip. 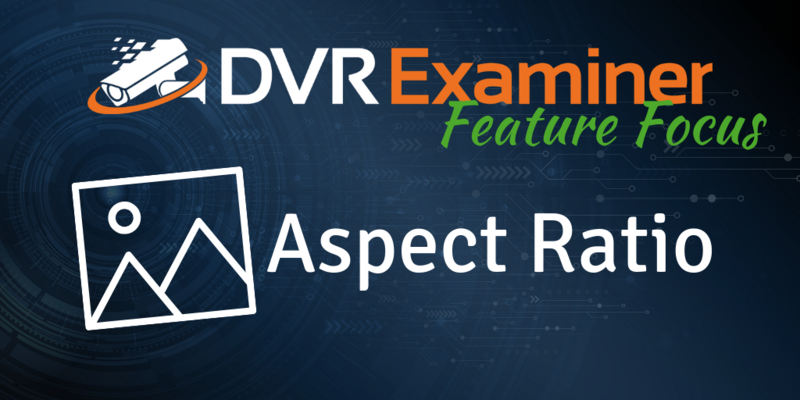 The “aspect ratio” button in DVR Examiner 2.5 is designed to detect cases where the frame appears to be significantly too short and adjusts the frame so that it appears much closer to the correct size and aspect ratio. Note that DVR Examiner doesn’t correct the aspect ratio. If the samples were rectangular, you would still see an image which may be about 10% too tall or too short. However, this makes reviewing the footage a lot easier, particularly in cases where the aspect ratio changes within the clip. By default, DVR Examiner enables the aspect ratio feature for all previews. If the video image appears to be too short, as described above, DVR Examiner makes an adjustment to make the previewed image closer to the intended resolution and aspect ratio. If it doesn’t, DVR Examiner simply does nothing. You can safely leave the button enabled and let DVR Examiner decide when (and when not) to adjust. If you disable the button, DVR Examiner always shows you the initially recorded frame with no adjustments. The preview window also displays the native and displayed resolutions for each frame to help identify when there are adjustments. Finally, if we can adjust the aspect ratio, why don’t we “correct” it and fix all the problems? There are a few reasons for this. One is that resizing in this way reduces the efficiency of the player. Another is that the frames do not appear as sharp after resizing. The real reason though is that we can’t. DVR manufacturers don’t seem to abide by any one standard, and so while we might know that the samples are rectangles instead of squares, we can’t be sure what kind of rectangles they are. An accurate correction would require some level of manual work and is unable to be automatically applied. Anything we might implement would only be an approximation.